3–5 Day Delivery with RUSH Peptide Synthesis Service. Made in USA 🇺🇸. LifeTein®, the custom peptide synthesis service company, has developed a proprietary PeptideSynTM technology. This technology provides a platform for continuous peptide synthesis using Fmoc and Boc chemistry and a proprietary solid support resin. This is one of the many reasons why LifeTein® can offer the low competitive pricing. LifeTein routinely uses our proprietary technologies to produce peptides >100 amino acids. The longest peptide we have made to date is 169 amino acids. We promise to provide the HPLC purified peptide with the correct molecular weight analyzed by Electrospray ionization (ESI) Mass Spectrometry. 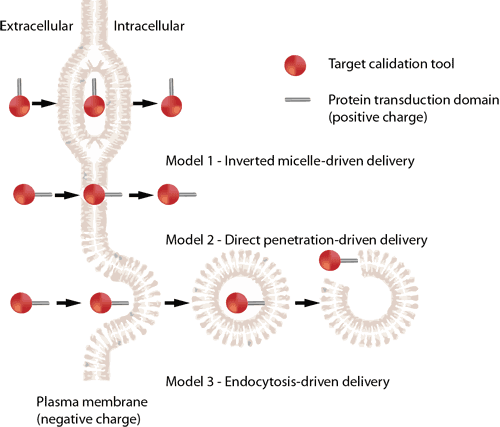 LifeTein provides peptides with special modifications including Peptide Oligo Conjugate, Stapled Peptide, Stable Isotope Labeled Peptides, Peptide Nucleic Acids, Fluorescent Peptide: Cy3/Cy5/Cy7, Phosphorylated Peptide, Glycosylation, Peptide pool service, Biotinylated Peptides, Cell-Permeable Peptide, Cyclic Peptide, Long Peptide Synthesis: 169AA, MAP Peptide Synthesis, and D Amino Acid Peptide. Click here to see the full list of modifications. NUCLEIC ACID VECTORS AND USES THEREOF: LifeTein synthesized a peptide of 133 amino acids. The peptide sequence includes at least one cell-permeable peptide (CPP) domain, one secretion signal sequence, one DNA binding domain, and other SHT protein. You might be interested in this article: How Do Peptides Fold? N Terminal Acetylation: Increase peptide stability by preventing N and C-terminal degradation. Stapled Peptide, Glycosylation, and Special Amino Acids: Palmitic acid increases the cell permeability and helps the binding of the peptides to a cell membrane. FREE aliquoting is available. Why aliquot? TFA removal service. Why remove TFA? Peptides are sealed to prevent oxidation. Why seal peptides? D amino acid peptides can be synthesized to resist common proteases. 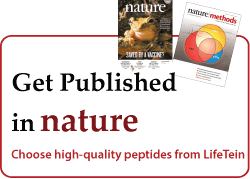 Choose high-quality peptides: Get published in Nature. Large capacity: We have the capacity to produce 5,000 purified peptides per month, ranging from crude to highly pure and complex peptides. Guaranteed quality: Peptide synthesis projects are carried out by using Fmoc and Boc chemistry under strict quality control based on HPLC and by mass spectrometry. 95% of all projects are finalized in 2-3 weeks to guarantee on-time delivery. Data protection: All sequences supplied to LifeTein® are considered to be the confidential property of the customer. LifeTein® hereby disclaims any rights whatsoever to any intellectual property or information provided by the customer, including materials or any peptide sequences. At the completion of the project, all synthetic peptides that meet the purity criteria will be sent to the customer. How should I store and handle the synthesized peptides? How do I detect small peptides using SDS-PAGE? The process of introducing medicines into cells has always proved to be a major challenge for scientists. However, CPPs have the ability to enter a cell through the plasma membrane independent of a membrane receptor. They are usually small peptides 10-30 residues in length. Click here or picture below for details. The following table shows a selection of currently known CPPs, together with their origins and sequences. Click here for more details.Check more for case studies. Our standard peptide synthesis package includes a certificate of analysis, and HPLC and MS reports. Amino Acid Analysis and N Elemental Analysis are available at competitive prices. Free peptide aliquoting services are available. TFA removal service is available. Discounts are offered for large orders. The turnaround time for regular peptide synthesis services is 2-3 weeks. Shipping price: $30.00 (U.S.), $30.00 (Canada), $65.00 (International). Method 2: Please complete the Quotation Form for the peptide(s) you would like to purchase and either fax it to 1-888-791-1618 or email it to peptide@lifetein.com. We will send you a formal quote within 24 hours. Method 2: Please sign the quote form we send you, and either fax it to 1-888-791-1618 or email it with your Purchase Order, if applicable, to peptide@lifetein.com. We will confirm your order within 24 hours.